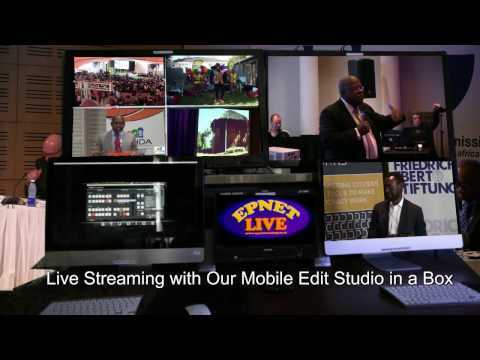 Webcasting Epnet » Events & Conference Filming – Video Production Epnet South Africa Live Streaming. Our prices and experience are envied by many please give Gordon a Call on +27 11 807 4034 or ask us for our price list. If you are planning to have a conference and filming services are needed to film and distribute the videos on memory sticks or online to your employees, delegates or attendees, then we have the experience and knowledge to provide professional videographers so that guests, speeches, presentations and all other proceedings can be recorded in high quality. Our conference filming service package provides two cameramen with three cameras and up to 8 hours participation time of which 2 hours is equipment set up and testing time. There are many benefits to having two camera operators, and one extra camera as a standalone one of which is that we will be able to film from different angles, which is extremely important in the editing process. This professional conference filming service is suitable if multi camera set up and professional looking video is required. Conference & Event Videography is a service offered by Epnet Live that can include a full-customization package depending on your needs and expectations of finished production. All the conferences we film are recorded in full HD quality and you have full rights to distribute the video for commercial uses. You will receive a link which will let you download the conference video in full HD, or we can supply you with your conference on as many memory sticks as required.